Vail Mountain is reached via three base areas: Lionshead, Vail Village and Golden Peak. The Northwoods Express lift takes you up to Buffalo’s, the highest point on Vail's Front Side (3,430m), from where you have great views over the Back Bowls and Blue Sky Basin. 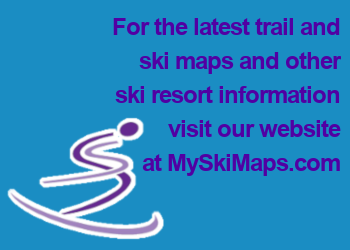 Intermediate skiers can take the green Swingsville trail from here to the relatively easy black Riva Ridge run – a four-mile-long, wide trail that cuts through the trees – and join the blue Riva Catwalk run all the way down into Vail village. Tentative intermediates skiers can avoid the steepest part of the Riva Ridge black by taking a blue section called Compromise. The Highline Express chair is located towards the edge of the Vail mountain boundary and is often fairly deserted as a result. It services three fairly challenging black runs including the narrow Roger’s Run through trees and the pretty, green Flap Jack run. This small bowl is the perfect introduction to bowl skiing for intermediates. The green Lost Boy trail circles the bowl, a series of blues drop into it from one shallow side, while black runs drop into the steeper, opposite side. Vail’s seven Back Bowls are ideal for inexperienced powder skiers, providing them with a safe, controlled, lift-serviced winter playground. While the pitch is only rarely steep, advanced skiers will find plenty to enjoy, from the gullies in Sun Down Bowl to steeper blacks like Genghis Kahn and Jade Glade in China Bowl. China Bowl has the only groomed blue trails in the Back Bowls. This giant powder playground was opened in 2001, providing 645 acres of off-piste accessible by lift. At its furthest point, Blue Sky Basin is 6.8 miles from Vail which, combined with the fact that the mountain closes at 3pm, means you should get there early and leave time to get back home. Although there are some great black routes (Champagne Glade and Little Ollie to name just two), it’s by no means restricted to advanced skiers – intermediates will love the long, quiet Grand Review blue off Pete’s Express and the gladed Big Rock Park blue.